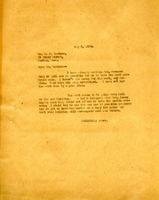 Martha Berry lets Mrs. Cresson know that she does not have the money for the portrait at this time. 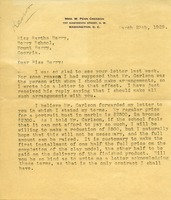 Berry tells Carlson that she has let Margaret French Cresson know that she lacks funds and time to continue with the portrait bust. She will work on getting a lower price for marble since Mrs. Inman has said they could not afford marble columns. 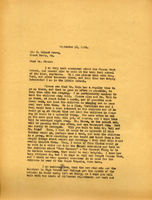 Mrs. Bussey gushes over the secondary beauty of Berry, second to the beauty of Miss Berry herself and says that The Berry School is the "true artists's dream". 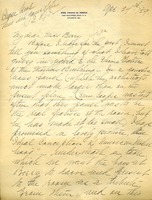 Mr. Harrington writes that the pictures have arrived at the Port of Baltimore. He asks her to make out the affidavit and return it to him so he can have the pictures forwarded. 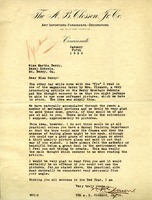 Martha Berry inquires about pictures that she has not yet received from W. E. Brown Decorating company. 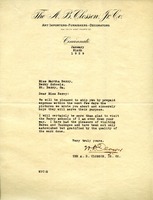 M. A. Harrington of W. E. Browne Decorating Co. writes to Miss Berry explaining that he will gladly look after her old pictures. 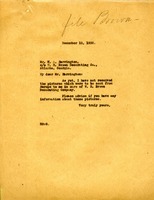 art, M.A.Harrington, pictures, W.E. 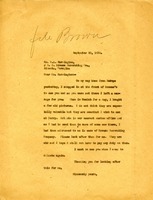 Browne Decorating Co.
Miss Berry writes to Mr. Harrington to advise him that she purchased some old paintings in Munich that she has sent to Atlanta in care of W. E. Browne Decorating Co.. She asks him to take care of them and says she will visit him when she goes to Atlanta again. 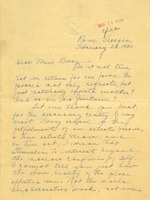 Berry accepts Closson's offer of a collection of unframed pictures, which can be framed in the Manual Training Department. 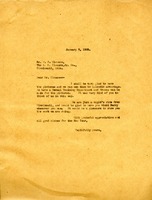 Letter offers a collection of unframed pictures to the Berry Schools if Miss Berry can find an economical way to have them framed.